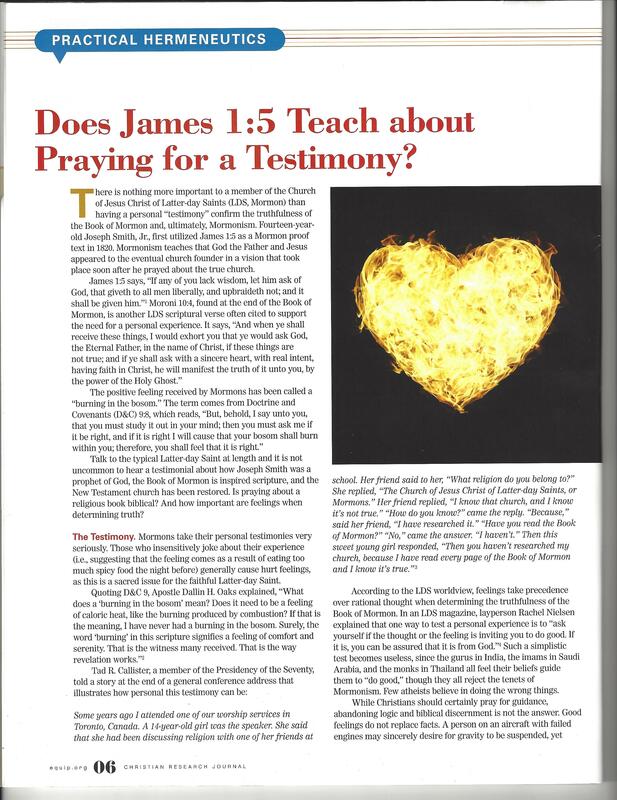 Does James 1:5 teach about praying for a testimony? This article first appeared in the Christian Research Journal, volume 37, number 6 (2014). There is nothing more important to a member of The Church of Jesus Christ of Latter-day Saints (LDS, Mormon) than having a personal “testimony” confirm the truthfulness of the Book of Mormon and, ultimately, Mormonism. James 1:5 was first utilized as a Mormon proof text by the 14-year-old Joseph Smith, Jr. in 1820. Mormonism teaches that God the Father and Jesus appeared to the eventual church founder in a vision that took place soon after he prayed about the true church. Talk to the typical Latter-day Saint at length and it is not uncommon to hear a testimonial about how Joseph Smith was a prophet of God, the Book of Mormon is inspired scripture, and the New Testament church has been restored. Is praying about a religious book biblical? And how important are feelings when determining truth? Mormons take their personal testimonies very seriously. Those who insensitively joke about their experience (i.e. suggesting that the feeling comes as a result of eating too much spicy food the night before) generally cause hurt feelings, as this is a sacred issue for the faithful Latter-day Saint. According to the LDS worldview, feelings take precedence over rational thought when determining the truthfulness of the Book of Mormon. In an LDS magazine, layperson Rachel Nielsen explained that one way to test a personal experience is to “ask yourself if the thought or the feeling is inviting you to do good. If it is, you can be assured that it is from God. ” [iii] Such a simplistic test becomes useless since the gurus in India, the imams in Saudi Arabia, and the monks in Thailand all feel their beliefs guide them to “do good,” though they all reject the tenets of Mormonism. Few atheists believe in doing the wrong things. While Christians should certainly pray for guidance, abandoning logic and biblical discernment is not the answer. Good feelings do not replace facts. A person on an aircraft with failed engines may sincerely desire for gravity to be suspended, yet wishing the situation away cannot counteract reality. In the same way, all the good feelings in the world cannot override false LDS teachings, which include the beliefs that God was once a human being, personal efforts must be added to grace for a right standing before God, and getting married in an LDS temple for “time and eternity” is a requirement for personal exaltation, or godhood. He should put himself in a frame of mind where he would be willing to accept (receive) all of ‘these things’—the Book of Mormon, the Bible, and the way God works with men. If the “right” answer isn’t received, then the onus is pinned on the seeker’s back to gain more “sincerity” or “real intent. ” Such reasoning provides a psychological edge to the LDS missionaries, especially when they deal with prospective converts who, in their hearts, desire Mormonism to be true. There are several reasons why a Mormon’s reliance upon a personal testimony does not make biblical sense. For one, James 1:5 is used in a way the biblical author never intended. The context specifically speaks about gaining wisdom, not knowledge. Wisdom is the proper application of knowledge. James tells his Christian audience that wisdom can be sought when undergoing trials and temptations. Many Mormons who rely on their testimonies have never thought through the implications of using prayer as a standard for measuring truth. Consider the subjectiveness of love, for instance. Most people have two, three, or even a dozen “significant others” over the years before finding the right person to marry. (And even this may not always work out the way it was expected!) It’s easy to “feel” in love during a romantic relationship. But when these temporary relationships fall apart, an objective look back may reveal that feelings were blinding the person to reality, serving as nothing more than deceptive roadblocks. Finally, many Latter-day Saints have never considered the implications for praying about a particular spiritual book or a religion. If praying about truth is commanded, then perhaps prayers ought to be offered concerning the scriptures of religions such as Islam (Qu’ran), Buddhism (Tripitaka), or Hinduism (Vedas). After all, isn’t it possible these other religions might provide a bigger “bang” for the buck? This doesn’t mean a personal testimony should be abandoned by the Christian. A heartfelt story may be a powerful apologetic tool and can be very effective. It just shouldn’t take precedence over the facts taught by the Bible, which is God’s litmus test for truth. [i] Dallin H. Oaks, “Teaching and Learning by the Spirit,” Ensign, March 1997, 13. [ii] Tad R. Callister, “The Book of Mormon—A Book from God,” Ensign, November 2011, 76. [iii] Rachel Nielsen, “What if I don’t feel a burning in the bosom?”New Era, June 2014, 19. [iv] “I Have a Question,” Ensign, March 1986, 50. This was quoted in chapter 52 of a church manual titled Book of Mormon Student Manual: Religion 121-122 (Salt Lake City: The Church of Jesus Christ of Latter-day Saints), 1996.